Stephanie Stuve-Bodeen set out to join the Peace Corps, as an ambitious, young American; willing to give something of herself, in order to bring about change in a developing nation. It was her experience, however, that just the opposite happened. The country and its people changed her. As she looks back on her time there, it was one week in particular, that she spent with a family in Tanzania, that inspired her to write her first book for children. 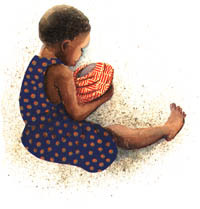 Elizabeti's Doll, illustrated by Christy Hale, is about a young Tanzanian girl named Elizabeti. Upon the arrival of her new baby brother, Elizabeti decides she needs a doll she can care for, the way her mother cares for the new baby. After looking around her village, Elizabeti finds a perfect and unique doll, and names her Eva. And one day, when Eva turns up lost, Elizabeti realizes just how much she loves her special doll. Stuve-Bodeen's sequels pick up where the first book leaves off. Mama Elizabeti, and Elizabeti's School reunite Stuve-Bodeen with illustrator, Christy Hale, for two more chapters in this endearing story. When Stephanie Stuve-Bodeen was a child, growing up on a dairy farm in Humbird, WI, she wanted to be Judy Blume! She began writing stories in elementary school, and got her first creative writing award when she was in fifth grade. She has wanted to be a writer ever since. After graduating from University of Wisconsin, River Falls with a teaching degree, she got married and then joined the Peace Corps. Upon her return to the US, she began teaching. Her next adventure was to start a family and try out her life-long dream of writing. Currently, Stephanie Stuve-Bodeen lives with her husband and their children in Hawaii at the Midway Atoll National Wildlife Refuge.